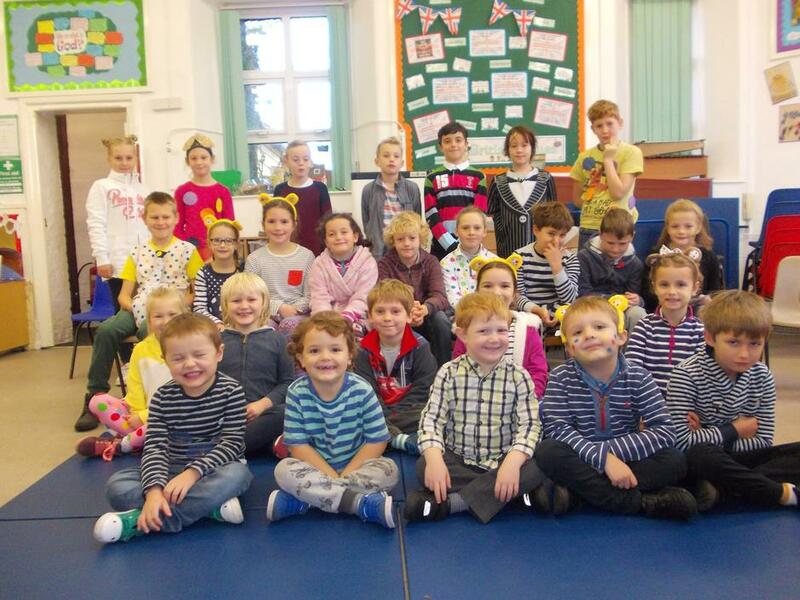 On 17th November we held our Children in Need Coffee morning. It was wonderful to see so many people from the community as well as families and friends of the children. We are pleased to say that £166.85 was raised. The children, and staff, had all made a terrific effort to dress in something spotty or stripy and the school council organised lots of activities for the children to undertake while the PTFA ran the coffee morning, we all enjoyed lots of delicious cakes and some biscuits decorated by the children. Also in November, class 2 children attended a Tag Rugby festival at Bradford School along with other children in the Federation. They were split into years 3/4 and 5/6 and mixed teams. They played 3 games each and really enjoyed themselves using all the skills they have been learning in PE lessons this term with Mr Pugh. Early in November, the children of Class One from Black Torrington joined lots of their peers from across the learning community to undertake a range of activities at the Multi-kills Festival on the MUGA at HCC. The sun was kind to us and shone all afternoon. The children were split into teams, and events were timed. They practised skills such as agility, throwing, catching, hurdling and balancing across a range of athletics-style events. The children enjoyed themselves thoroughly, having the opportunity to show off the skills they had already been learning with Mr Pugh in PE lessons. A massive thanks to Mr Pugh and his sports leaders. At the begining of November, the children of Class One from Black Torrington joined lots of their peers from across the learning community to undertake a range of activities at the Multi-kills Festival on the MUGA at HCC. The sun was kind to us and shone all afternoon. The children were split into teams, and events were timed. They practised skills such as agility, throwing, catching, hurdling and balancing across a range of athletics-style events. 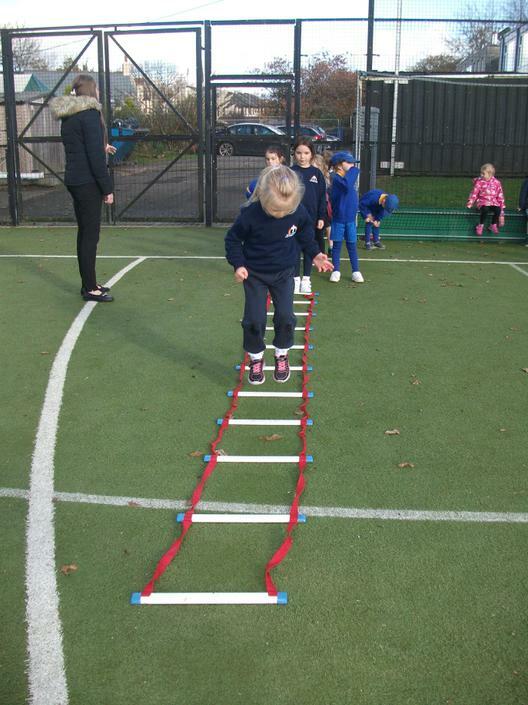 The children enjoyed themselves thoroughly, having the opportunity to show off the skills they had already been learning with Mr Pugh in PE lessons. A massive thanks to Mr Pugh and his sports leaders. 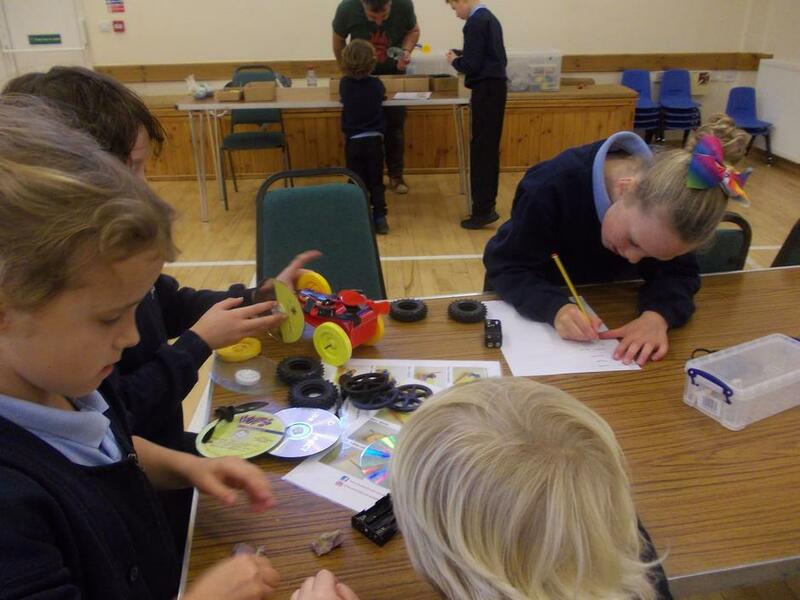 Just before half term WonderStruck Science visited Black Torrington again, this time to teach the children about building their own team fan-powered cars. The children were given a kit and instructions to build prototype cars, and then Peter explained the different ways the cars could be modified to improve the speed. The children undertook time trials, recording their results and making changes as they went along. The morning finished with a tense race between all the cars to find an overall winner. The children showed great tenacity and perseverance as they applied their science knowledge and engineering skills. We would like to take this opportunity to thank the PTA for paying for this enhancement activity. 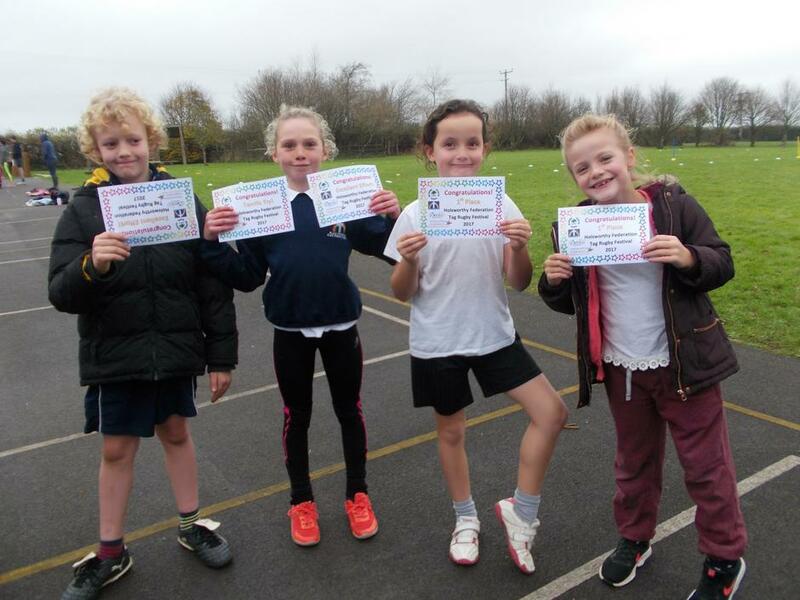 Earlier that week, Class 2 attended a Cross Country Festival at Holsworthy Community College along with other local schools. 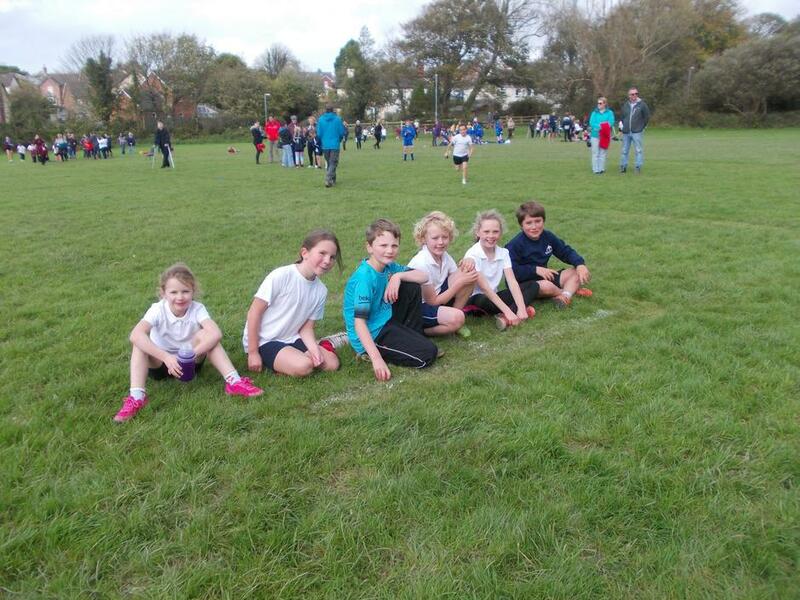 Years 3 and 4 ran one lap of the field and years 5 and 6 ran 2 laps, girls and boys ran separately. The children ran well and were very supportive, cheering on the other groups of runners. Points were scored based on finishing positions. The years 3 and 4 team were runners up and received a certificate. Well done. Also that week, Scott and Teresa came from Bideford fire station to talk to the children. Class One watched a video explaining all the different jobs the fire service do. During the session, the children were taught about how to stay safe on Bonfire Night, to make sure adults in cars do up their seat belts before starting the engine and how to avoid hazards in the home. Roxanna and Rowan practised how to test a smoke alarm. The children were taught what to do if they discover a fire – shout ‘FIRE! FIRE! FIRE!’, which was so loud even Mrs Manners heard it in the office. Rowan knew we have to shut doors behind us to slow the spread of a fire. Emilia knew we all need to get outside and Abigail knew we had to call 999 and ask for the Fire Service. The children practised the ‘stop, drop and roll’ technique. 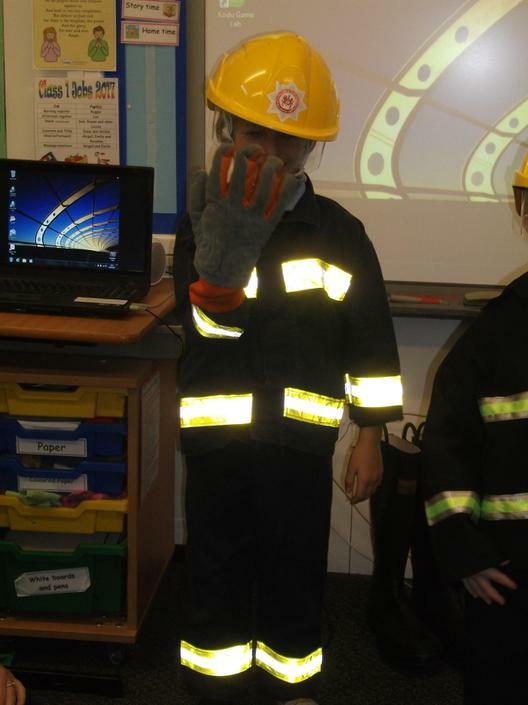 Abigail and Emilia role-played a person reporting a fire and the emergency services control operator. Isaac and Leo were dressed as firefighters as Scott and Teresa explained why special clothes have to be worn. Class 2 learned about smoke alarms, how to ring 999, about dangers within the home, planning escape routes and how to “stop, drop and roll” if your clothing is on fire. Earlier in October we held a social lunch, families from class 1 children came in and enjoyed a roast chicken lunch and then joined the children in the playground. 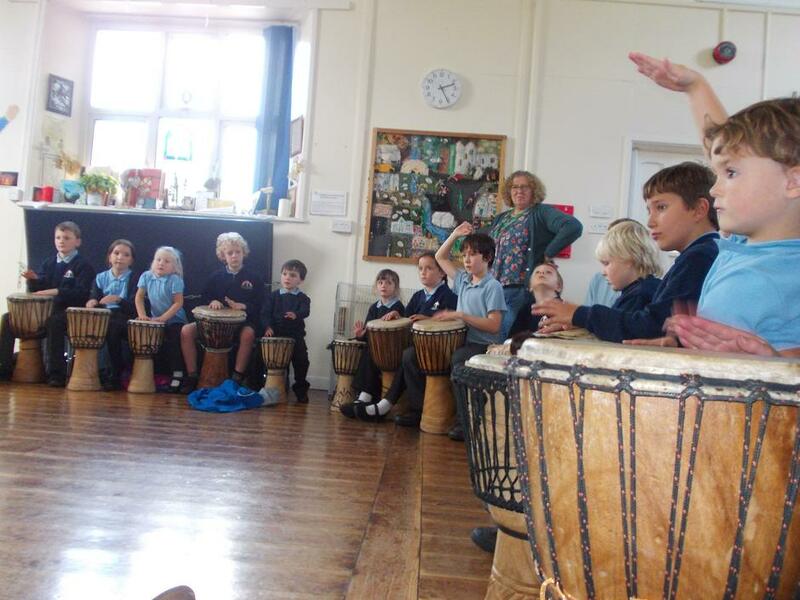 At the beginning of term, the whole school went to Bridgerule School to take part in a Drumming Workshop. They had a fantastic time learning different rhythms based on being animals, elephants, snakes and creepy crawlies. They had the opportunity to play Bougarabou and Djembe drums and then watched a performance. “ I really enjoyed watching Bridgerule year 6 playing and then I had to go up and join them playing my favourite drum” said Archie S.
“ We had to copy what the man did, the drum was quite big but it was easy to do and I really enjoyed it “said Emilia.